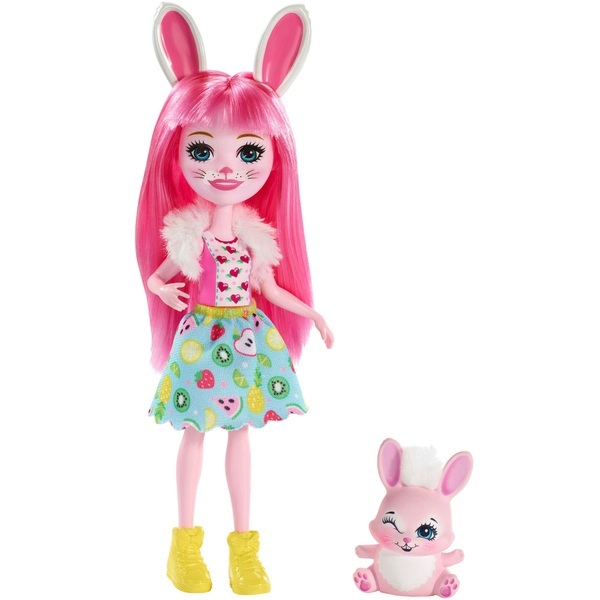 The creative Bree Bunny doll comes with Twist bunny figure - so cute coloured pink with arms wide and a furry touch at the top! Let Bree Bunny doll and her bunny friend Twist enchant you. The Enchantimals dolls are lovable characters who share a special bond with their animal friends - they're always together, and they look alike, too! The 15cm doll comes with Twist, her bunny friend - so cute in pink with arms wide and a furry touch at the top. Bree Bunny doll wears a colourful outfit that matches her bouncy, creative personality: it has floral prints on the bodice and furry trim on the removable skirt. Bunnies wrap around her ankles on her pink shoes, and bunny ears poke from her rooted pink hair -- she even has whiskers on her face. Kids will love recreating the special bond these friends share and celebrating a world where Caring Is Our Everything. Collect them all to build out a world of Enchantimals and tell enchanting stories of your own (each sold separately, subject to availability). Colours and decorations may vary.